Samsung’s speculated Galaxy Tab 4 7.0 tablet’s press render has been leaked online. It seems the company has no plans to change the basic tablet structure that is found common in all Samsung tabs. According to @evleaks, who shared the images, Samsung will continue with its current tablet design language. The press render is not a very elaborate showcase of the new Galaxy tablet, but details like power button, volume control keys and a physical home button are visible. Following the basic Samsung design pattern, these buttons are placed at the same spots. One can spot the power button on top right corner above the volume keys, on the side. 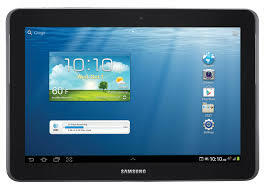 The Samsung Galaxy Tab 4 7.0 slate features a home button on the front bottom along with a camera on the top right side. It also has multitasking touch buttons on either side of the home button. As per earlier leaks, the Galaxy Tab 4 7.0 may feature a 17.7-cm (7-inch) 1280 x 800p HD display. It will run a 1.2 GHz quad-core processor with a 3 MP rear camera, 1.3 MP front camera. The company may pack a massive battery of 4450 mAh, considering the excessive power drain problem in many of its devices. The slate will further carry 1 GB RAM, 8 GB internal storage, and a microSD card slot. It will support connectivity via Wi-Fi and Bluetooth. Rumours also suggest that Samsung will introduce only the Wi-Fi model of the new Galaxy tab with (SM-T230), 3G (SM-T231) and LTE (SM-T235) variants. Samsung is yet to confirm the price and availability of the Galaxy Tab 4 7.0. The press render mentions 24 April as the possible date for the announcement.